I've never really been one for memoirs written by celebrities. In a genre overrun with "books" by Miley Cyrus and Spencer Pratt/Heidi Montag (barf), it's rare to just find a witty, fun book by a down-to-Earth celebrity. I recently gave Tina Fey's Bossypants a try and since I liked it so much, I hoped that Mindy Kaling's book would be just as great. Mindy covers her life as a "chubster" kid, her college years, and how she got to her position in comedy as an actress, writer, and director. She also throws in other "life lessons," such as karaoke etiquette and how men should properly dress (amen). Two of my favorite quotes are "There is no sunrise so beautiful that it is worth waking me up to see it,” and "Bren and I befriended each other early on. We clung to each other with blind loyalty, like Lord Voldemort and his snake, Nagini. I, of course, was Nagini." My favorite section was the part about her life working and acting on The Office, which used to be my favorite television show ("used to" as in I got extremely bored not long after Michael left and haven't watched since). She quickly establishes that she is NOT like her character Kelly, at least in the bad ways. Mindy has injected so much of her personality into her work and it really shows. I loved hearing about the different actors on and off set, as well as the writing process and finding out which episodes and bits Mindy wrote or came up with (Kevin spilling chili all over himself/the floor in a cold opening was her brainchild? Excellent). There have been a lot of negative reviews about the book, dismissing it as pure fluff and having no substance. What did you expect? This isn't high literature, it's just fun. The overall tone is very casual, as if you are just talking to a friend. The book isn't chronological and arranged in neat chapters, it's more or less a collection of random thoughts/reflections. It can seem a bit spazzy at times or egotistical. She also spends a lot of time professing her love for Amy Poehler, but really, who doesn't love her? I was a huge fan of The Office as well. Still watch a little but not with the same enthusiasm. I'm glad you liked this book. I think she is an interesting young woman with an amazing career. What's wrong with a little fluff now and then? And seriously, who thought she was going to write LITERATURE? Sometimes you need to just go with the flow and read something light! This sounds so amazing! I'm adding it to my to-read pile! Thanks for sharing. I really need time to read this book. I loved reading her blog and enjoy her humour. I'm glad you liked the book and could enjoy it for what it is! I loved this book too-I'm a big fan of Mindy and her writing so it was a no-brainer to read this. 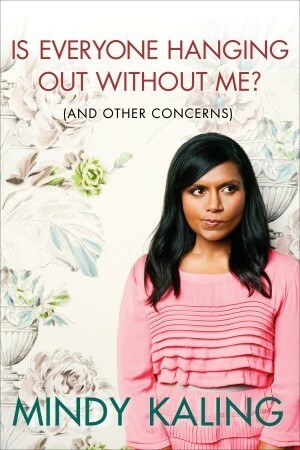 I also used to love The Office as well-Season 2 is near perfection-and am loving her on The Mindy Project. This review, basically perfectly sums up my feelings on this book! Great review! I loved this one too. I think one thing that led to lukewarm reviews of this book is that it came out around the same time as Bossypants...and in comparison to Fey's book, it's not nearly so funny. But if you read it on its own without doing any comparing, it's pretty great. Just a bad stroke of luck with the publication time I think! I'm sure this would be a great book to read, but i don't know if i could get past feeling like kelly kapoor was reading it to me. i wonder if she's narrating her own audiobook like tina fey did? because then it would be mindy and not kelly, and i might could handle that a little bit better. Plus then it would be really really funny instead of just really funny. Kaling's book is remarkably enjoyable, and spotlights the writer in a new way.In the introduction, she says she'd like to be friends with Beyonce. Well, I'd like to be friends with her.